Select Photo ad under the "Unpublised Page post ads" section. Type in the post texts you want. You can add multiple texts to test what works bests. In the example above I have added two texts. To get line breaks, please typ press down shift and return. The recommend number of characters for the post text depends on which placement you choose. You can add multiple images to your template. In the example above I have added three different images. Qwaya will create one ad for each combination of the post texts and images, in this case I will get six different ads. Don’t forget that your images can’t contain more than 20% text, here you can test your images. Select where on Facebook you want your Page Post ad to be shown. You can also skip saving the template. 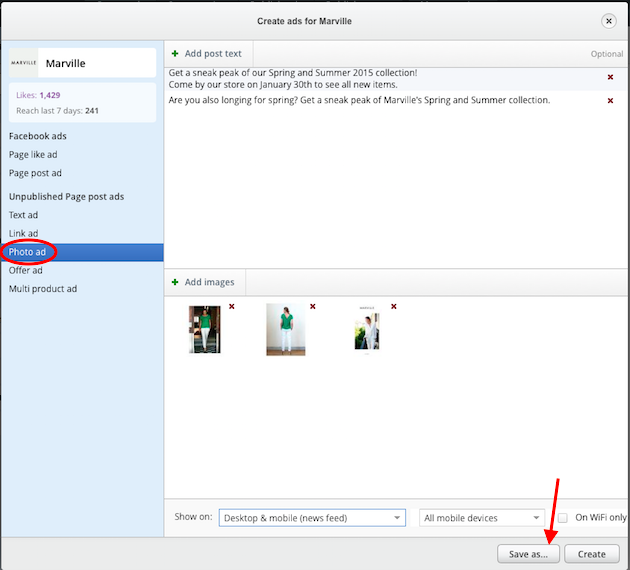 In this case click on the “Create” button when you are done adding titles, bodies and images. If you chose to not save the ad creative as a template the content will not be saved for future use but you will have all the creative added to the Preview creative field in the main window. Once you have generated the unpublished page post Photo ads creative you are ready for the next step. Go to “Set Targeting” to set up your targeting for the generated creatives.